PARIS — Future space tourists may be able to toast the view from orbit with fine champagne, after designers came up with a high-tech bottle made for knocking back bubbly in zero gravity. The Mumm champagne house teamed up with designer Octave de Gaulle, who has specialised in conceiving of everyday objects for the final frontier, to develop the space-age bottles. Journalists from several countries will try the champagne on Wednesday during a flight taking off from the French city of Reims, in the heart of champagne country. The specially equipped Airbus Zero-G plane will make a series of parabolic maneuvers, climbing steeply before plunging down to create 20-second spurts of weightlessness. The target audience is not astronauts, who are not allowed to drink alcohol on the International Space Station. But the coming wave of sub-orbital and orbital space tourism promoted by private operators such as Virgin Galactic and Amazon founder Jeff Bezos’s Blue Origin could prove an ebullient audience for cosmic connoisseurs. “They won’t have to be performing any professional tasks onboard, so they’ll probably be able to drink a bit of alcohol,” said astronaut Jean-Francois Clervoy, who heads the company which operates the Airbus Zero-G. In zero gravity, the challenge is quite simply to get the wine out of the bottle. “You could imagine drinking it with a straw,” said physicist Gerard Liger-Belair, who consulted on the project—though it’s unlikely you’d ever find a champagne fan stooping to such an indignity. 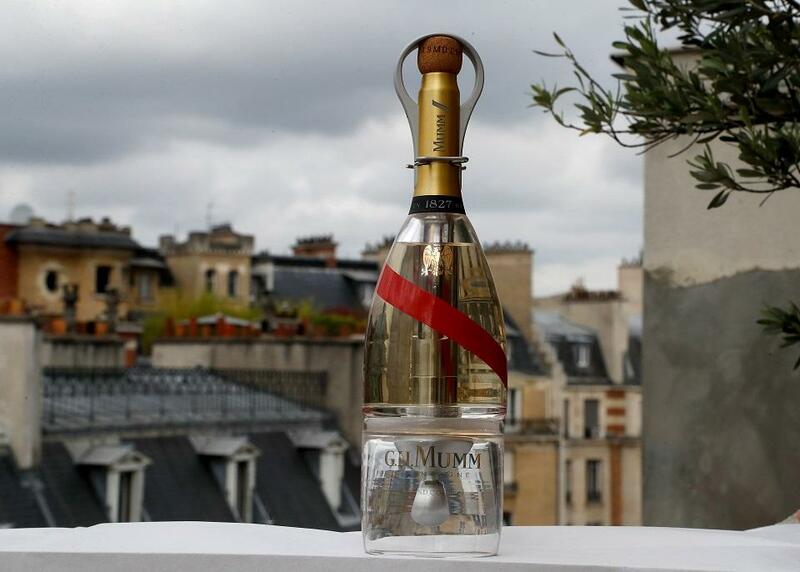 In search of a more elegant solution, around three years ago the Mumm team turned to De Gaulle—a great-grand-nephew of the French wartime leader Charles de Gaulle—who came up with a bottle divided into two chambers. The champagne is in the upper portion, while below is a finger-controlled valve which uses the champagne’s own carbon dioxide to eject small amounts of wine which emerges as foam. Catching your champagne foam The next trick was to stop the wine from streaming across the cabin, for which De Gaulle created an aluminium strip that forms a ring over the top of the bottle to capture a bubbly sphere. “Then you rotate the bottle and the foam sphere is released,” he told AFP in his Paris workshop. Drinkers can then scoop the wine out of the air using a tiny yet long-stemmed glass which resembles an egg cup. Clervoy said the moment the foam turns to liquid in the mouth is a sensation that can’t be matched on Earth. “It’s really magical because the champagne lands not just on your tongue but on the palate, the cheeks—the gastronomic sensations are magnified,” he said. Mumm is now looking for a partner, either a public space agency or one of the private upstarts. In the meantime, De Gaulle plans to refine his prototype, and who knows, one day astronauts might be able to ring in a new year while on a mission.